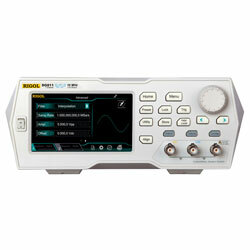 Saelig Company has two new 16-bit Arbitrary Waveform Generator series from Rigol Technologies. Both series are created with unique SiFi II technology to generate accurate 16-bit standard, and arbitrary waveforms point by point from large internal memory series. These versatile signal sources generate precise, very low jitter waveforms with high-frequency stability and are housed in intelligently designed cases that remove the requirement for internal cooling fans, giving silent operation. A 4.3″ touch display gives exceptional control and waveform viewing. The touch-enabled user-interface design offers an efficient operational experience, even supporting tap and drag operations. The units can output min/max signals of 1mVpp to 10Vpp into 50Ohms and give analog and digital modulation functions that include AM, FM, PM, ASK, FSK, PSK, and PWM. Arbitrary waveform sequence and waveforms also can be generated or edited through the available PC software. A multitude of built-in arbitrary waveforms are incorporated with both series to cover the common signals in most engineering applications, auto electronics, math processing, medical electronics, and other fields. Also included in the design is a built-in seven digit 240MHz full-featured frequency counter.